As I mentioned it before, I got my hands on two boxes of Dunkin' Donuts: 6 donuts and 10 muchkins. Someone happened to be in the area and picked them up for me. It was an one hour wait, so I am very grateful. I have never tried anything from the Dunkin' Donuts before, so I can't really make any comparisons with the real deal. I will just share my thoughts on them. It was a surprise for me what kinds of donuts I would get, since I didn't make up a wish list, but I think I would have picked out almost the same ones in the store. There is a nice variety: some with toppings, some with jam filling, one of the Netherlands only flavors, and the famous Boston creme. It was already late when I received the box with 6 donuts, so I didn't eat them immediately and waited until it was time for dessert after my dinner. Since I can't eat them all at once, I picked out two that looked the most delicious and left four for the next day. This is the Tulip donut, which comes in the colors: white (the one I got), yellow, red, and orange. Maybe, there is also one in blue, but these are the colors that I have seen in the pictures I got of the Dunkin' Donuts shop interior. The chocolate tulip is very hard, so it was almost impossible to cut it in half. Inside, there is a chocolate cream filling. Opinion: The chocolate tulip part is very delicious. The milk chocolate was quite tasty, there was some white chocolate on top, and it had a bit of a crunch. You also get quite a massive piece too. It is not just a flimsy piece of decoration, but a piece of chocolate that you can find in a box of chocolates. But besides that, I didn't really like the rest of the donut. The chocolate frosting didn't taste really good and the filling had a similar chocolate flavor. It didn't really surprise me. This is the Rocky Road donut. On top, there are some mini marshmallows, small cubes of soft caramel fudge, and buttery cookie crumb. It has a chocolate frosting and a hazelnut chocolate filling. Opinion: I like the different elements on top of the donut. I tried eating them on their own and they were all really tasty. The only flaw is that you don't get to taste them in every bite you take (only in the center) and you need to be careful that they don't fall off when you take a bite. 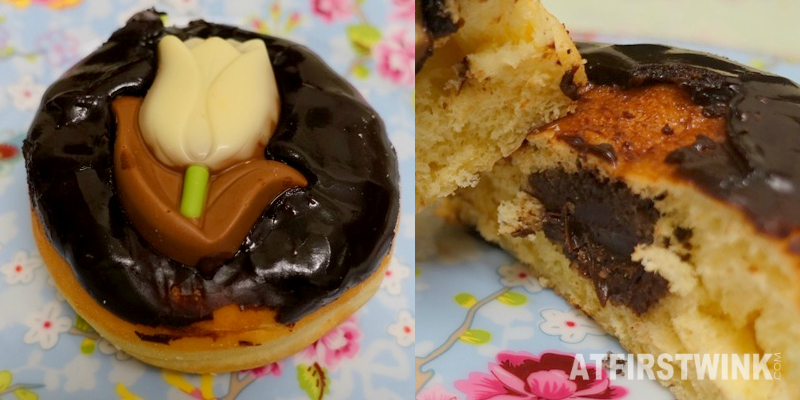 While I was a bit disappointed by the filling in the Tulip donut, I really liked the filling in the Rocky Road donut. I think the filling is similar to Nutella. The hazelnut flavor is quite strong and blended well with the creamy chocolate. I left these four donuts for a big donut tasting session the next day: White chocolate Oreo, Blueberry Square, Boston creme, and Jelly filled shell. Blueberry square looked really unique with the blue frosting and the white sprinkles on top and a lot of blueberry jam filling (almost like a generously applied jam sandwich!). Opnion: I hate to say that I didn't really like it. 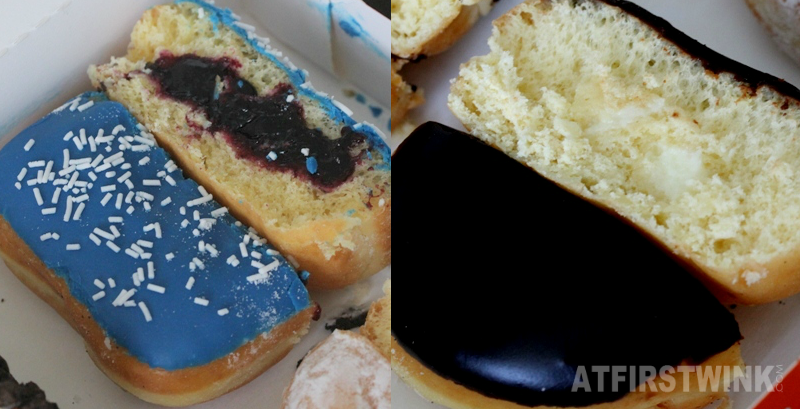 The blue frosting tasted a bit artificial and the jam was a bit on the sour side. I normally like everything that is sour, but it should have a bit more sweet and fragrant blueberry flavor. The Boston creme actually reminds me a bit of the Dutch Bossche bollen. I think the main difference is that that is more like a large choux creme and this is a cream filled donut. Opinion: I honestly like that there is a lot of cream filling in there. It makes the otherwise relatively dry donut moister and there is enough for every bite you take. But as I said before, I don't really like the chocolate frosting, and the white cream tastes a bit plain. I wish there was something like a subtle vanilla flavor. 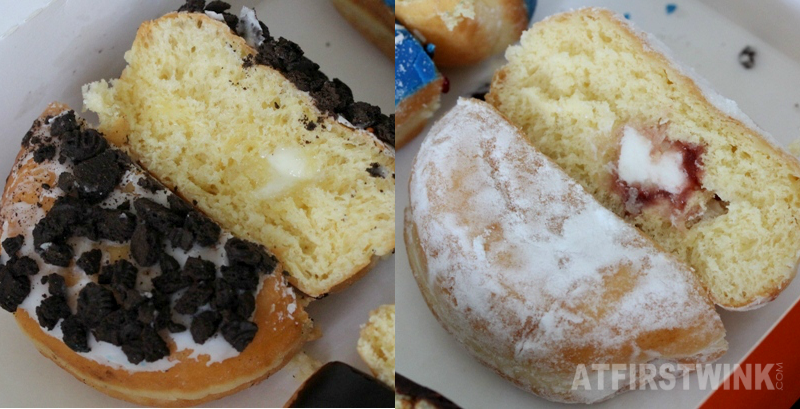 White chocolate Oreo is a donut with a white chocolate frosting and bits of Oreo cookies on top. I am not really sure what the filling is. It is not really like the white cream in the Boston creme, as it has a thick, syrupy texture like condensed milk. But it taste a bit like coconut too. I think they wanted to make something that tastes similar to the creamy filling in between the Oreo cookies. Opinion: I don't know if it is because I left it for the next day, but the cookies weren't very crunchy anymore. The white chocolate frosting was okay, not extremely delicious. The filling wasn't that bad either. Jelly filled shell is a donut covered with icing sugar and it has a strawberry jam and cream filling. Opinion: I unintentionally saved the best for last. It looks really simple from the outside, no fancy decorations or colorful frosting. But the icing sugar makes it feel as if the donut melts in your mouth. Somehow, it makes the donut tastes softer and fluffier than the others. I also really like the amount of cream and strawberry jam. It is very well balanced. The strawberry jam is also not too sweet or too sour. What do I think? The donuts didn't taste really fresh. They were a bit hard and dry. I think it has something to do with that they expected a large crowd and to sell more donuts than they can make on that same day. They don't want to let customers down by having them wait in line for a long time and leave empty-handed, so they needed to make a large batch beforehand. I want to give them another chance and I will try to come by another time, when it isn't so busy. At the moment, there are only four kinds of munchkins and since I got a box of ten, I got to taste them all. The four kinds of munchkins are: Boston creme, Hazelnut, Chocolate hazelnut, and Raspberry truffle. The Boston munchkin is like the miniature version of the Boston creme donut. But strangely enough, it has a delicious, yellow, vanilla cream, which I like a lot more than the white cream. The hazelnut munchkin has the same outer appearance of the Jelly filled shell donut (icing sugar covered donut), but it has a hazelnut chocolate cream filling instead. 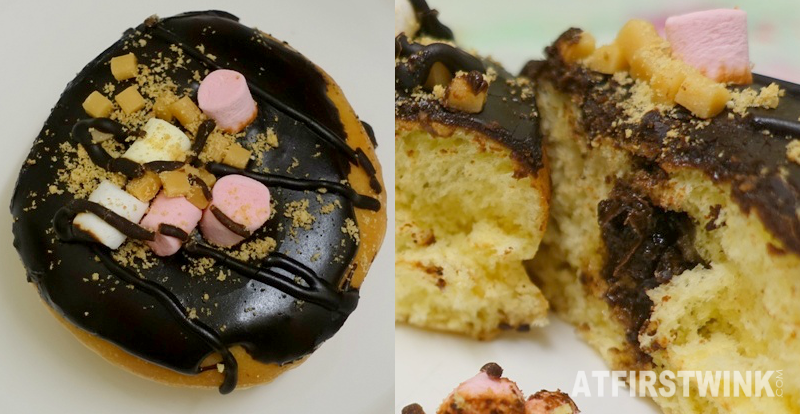 The Chocolate hazelnut munchkin has a crunchy, sugared hazelnut puffs exterior (similar to the ones you get at the sides of birthday cakes in the Netherlands) and a chocolate donut center (no filling). I don't know why, but I just don't really like the chocolate flavor that Dunkin' Donuts uses in most of their products. I can't really put my finger on it, is it the amount of bitterness of the cacao, milk, or sugar? So, I really like the crunchy outside, but the chocolate donut center not so much. Raspberry truffle munchkin is the one with the Dutch hagelslag (chocolate sprinkles) exterior and a normal donut center. This one puzzled me the most. At first, I didn't know what the flavor of this one was (I looked the names up only when I sat down to write this blog post). To me, it was like a lemon drizzled cake with a light - and a bit odd - bitter end taste. To be honest, it tasted a bit like a mouthful of hagelslag and a strange, sour lemon cake. The flavors really clashed. I think the main problem is that the raspberry flavor isn't really strong, as only the slight sourness came through.